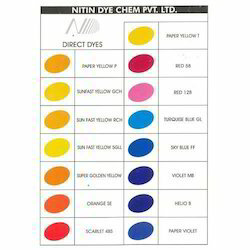 Leading Manufacturer of paper direct dyes from Vapi. As the leading manufacturer, exporter and supplier in the concerned field, we offer a quality grade of Paper Direct Dyes. The offered dyes are processed using supreme quality chemical compounds and ultra-modern technology as per the industry quality standards. Due to their different quality features, these direct dyes are available in different packaging options. Besides, clients can avail these dyes from us at market leading prices. Looking for Paper Direct Dyes ?